The idea was first planted in my head after reading a post that SweaterMeat put up on Ugly Food Tastes Better back in November: corned beef. Fatty, salty, flavorful corned beef. Yum. But then came the holidays and that thought got buried under a bunch of other food thoughts: pumpkin pie, bourbon pecan pie, rice congee with leftover roasted turkey, glazed ham, ham fried rice, almond cookies. The problem was that I didn’t have any corned beef . . . yet. I did have brisket from my CSA, and as Jen reminded me, corned beef is essentially brisket that has been brined with different spices. There is no corn in corned beef. The “corn” in question refers to the large crystals of salt that used to be rubbed into the meat to cure and preserve it for long voyages at sea. Brining has pretty much replaced salt curing for making corned beef — which brings us back to Jen’s post in which she adapts Tyler Florence’s recipe for brining brisket. That recipe was very similar to the one I ended up adapting from Saveur, but the one in Saveur includes one other curious ingredient: pink salt. Pink salt, as I found out in a panic as you will soon read, is not Himalayan Pink Salt. Himalayan Pink Salt is a very pretty finishing salt. Pink salt is also known as Prague Powder #1, and it is a combo of table salt + sodium nitrite. It is dyed pink so you won’t mistake it for regular table salt and accidentally kill yourself. Because sodium nitrite in not-so-large quantities is poisonous. But it also inhibits bacterial growth and botulism, making it a common food additive along with sodium nitrate. I didn’t know any of this when I decided to brine my brisket for 5 days (most recipes that I have seen put brining time anywhere between a relatively safe 6 hours to 14 scary-sounding days — with 5-10 days being the most common). Once, I accidentally over-brined a turkey and was left with a pretty toxic carcass whose smell was described to me as something that we have evolved to recognize as hazardous to our health. So admittedly, I freaked out. Oh my gosh, I thought, I am going to eat this beef petri dish and die of botulism. Or listeria. I googled everything: was it okay to brine brisket for 5+ days without the pink salt? Shouldn’t the salt solution inhibit bacteria growth without the sodium nitrite? Sodium nitrite is pretty nasty, did I really want to cook with it anyway? Was I going to die? Did the Pilgrims have sodium nitrite? Oh crap, tons of them died! In the end, I put my trust in Michael Ruhlman (when in doubt . . .), who assured me that even though my brisket would probably not be pinky-pink, I certainly wasn’t going to die from botulism or listeria. Besides, Ruhlman said, any excessive bacterial growth would essentially be rendered harmless from prolonged exposure to heat, ie. cooking anyway. And he was right. I didn’t die, Sharon didn’t die, and the corned beef was really, really good. 1. Combine all the spices in a small skillet. Toast them over medium heat until they are fragrant. Be sure to swirl the pan constantly so that the spices do not burn. Transfer about 3/4 of the mixture to a 2-quart saucepan. Keep the remaining toasted spices in a tightly sealed jar in the refrigerator. 2. To the spices in the saucepan, add 4 cups of water, the salt, and the sugar. Bring everything up to simmer. Turn off the heat, and let the brine cool to the point that you can put it in the fridge to chill overnight. 3. In the morning, double up two gallon-sized Zip-loc bags. Position the trimmed brisket in the inner bag, and add all the brine. Squeeze out as much air as you can. Seal both bags. Arrange the bagged brisket in a large dish and refrigerate it for 5 days, turning it over every other day. 4. On the last day of brining, remove the brisket and rinse it off well. Put it in a large Dutch oven with the remaining toasted spices, the cut-up onion, and the garlic cloves. Cover the brisket with water and simmer it until it is tender. I only simmered mine for an hour, but really I could have cooked it for much longer. When the brisket is nice and tender, remove it to a plate and cover it with foil. 5. In the meanwhile, boil the peeled potatoes in a pot of salted water until they are easily pierced with a knife. Drain them and set them aside. 6. Put the cabbage in a large pot set over medium heat. Add the lemon juice, about 1/2 a cup of water, and 2 tablespoons of butter to the cabbage. Cover the pot and cook the cabbage, stirring every now and then, until it is tender. This should take about 30 minutes. Adjust the seasoning. 7. To serve, cut the corned beef into thin slices across the grain. Serve the slices warm, with a few potatoes and some of the cabbage. And as Jen points out, any leftovers make terrific corned beef hash! There’s only 2 of us at home, but we love the corned beef. My husband makes a tangy mustard sauce and we have sandwiches for lunch for days. In fact, I’ve got a supermarket-made corned beef in the freezer right now. It never occured to me to cure my own corned beef. It must be very satisfying! I always keep Himalayan pink salt in the pantry and I use it for cooking, not just for finishing. Glad to see you used it successfully. 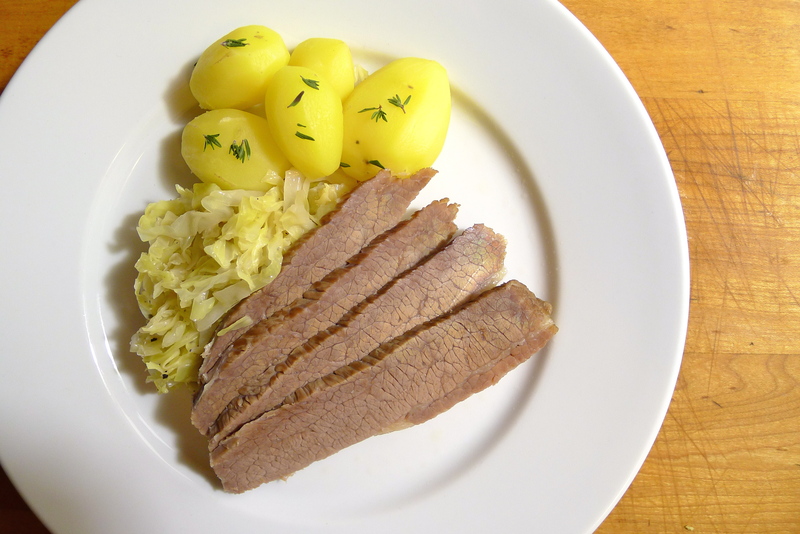 Now that you have made corned beef, do you think you could do the same to other cuts of meat? Liked corned venison or corned lamb? I was seriously worried that I was going to poison myself. I even looked up how long it takes symptoms of botulism to show up (12 hours). I’m nuts! Have you ever seen these giant slabs of Himalayan Pink Salt? Apparently you can throw them in the oven and cook on them. No need to season since your food is cooking a huge block of salt. Very interesting . . .
That’s also a good question about corning other meats. I mean, why not! Amazing… I have to try it out one day! Thanks, Lior! It’s definitely something you have to plan ahead to make. I haven’t had corn beef in such a long time. And I have no idea why I haven’t, but this just looks simply incredible. And that cabbage.. delish! Aw, thanks! The cabbage was super yummy. If I had it, I would have added some caraway seeds to the cabbage . . .
Anywho…..Hubby and I were watching American Muslim a few weeks ago and during the show the new Muslim wife made Halal corned beef for her new Irish Muslim husband. I thought, Wow!, Halal corned beef? How do you make THAT? Another great post, Bacon Biscuit! The corned beef looks super duper wicked yummy! Thanks for sharing your adventure. That’s so cool that you went to cooking school! I would love to do that. My brisket was relatively small, but for one that is double or triple the size, I can imagine that the brining time would be long. Halal corned beef sounds crazy! American Muslims make Jewish deli staple. It’s peace on a plate! This is one recipe that I’m itching to try ever since I saw Rick Stein made it on his show when he was in Ireland. It seems like a lot of work and will require a big audience of eaters so I have to make this when there is a big occasion. Rick Stein made it? I have to look that up! Corned beef is pretty easy to make, but it does take some advanced planning and moving stuff around in your fridge. Most of the recipes that I read said to keep the brisket submerged in large container, but I thought a zip-loc bag would be easier and less messy! I’ve heard about the giant slabs of salt, but I would worry that being in the kitchen, it might get wet from time to time. I imagine you can’t exactly wash the slab? I have a large chunk of salt (bowling ball size) with a hollow in the middle which holds a tealight candle. In the humidity of Auckland, the salt has “melted” quite a bit already. They make it sound super exciting, but it’s true that after a close perusal of their FAQ’s, I don’t see anything about cleaning. They do say that old slabs can be broken up and chucked in the bath. Maybe that’s how you do it: big salt-cured salmon dinner followed by a long soak in salty fish bath! LOL! I am quite happy you didn’t die and especially happy your corned beef turned out great. Love the addition of the taters! And thanks for the inspiration!